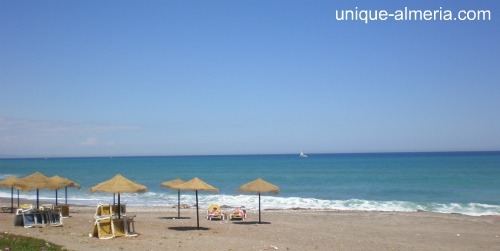 Mojacar is a hill-top village and beach resort, and is one of the most beguiling and captivating corners of Spain. 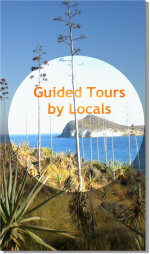 The "pueblo" (village) is the kind of picturesque place that you might see in fairytale book. 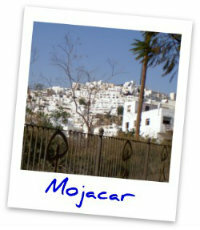 Perched high on a hill this cluster of white washed square buildings resemble sugar cubes when viewed from a distance. 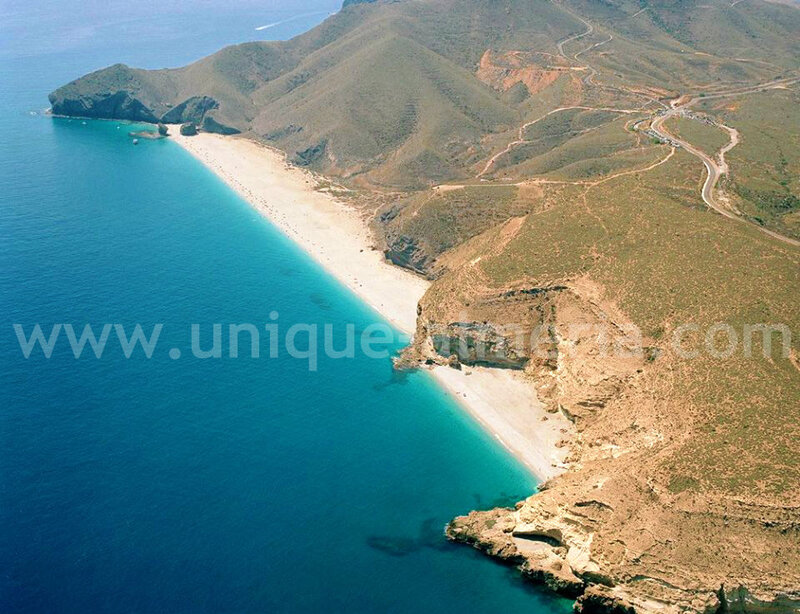 Sandwiched between the Sierra Cabrera mountains and the Mediterranean coastline there have been settlements here for over four thousand years. At one time or other the Phoenicians, Greeks and Romans have all called this place home, but it is the Moorish imprint that is evident today, particularly in some of the architecture, and the labyrinth of narrow and steep cobbled winding streets. Lining these are cafes, boutiques and trinket shops selling a vast array of locally made arts and crafts. As you gently follow the twists and turns and ups and downs of the roads you’ll also come across numerous small squares. Each one is unique, with its own distinctive feel, vibe and atmosphere. The Plaza Nueva is the main square and offers stunning views over the neighbouring countryside. The huge marble terrace hangs over the side of the mountain and is where locals and tourists gather to sip their cortados or café Americanos and admire the landscape before them. In the summer months when the sun is at its fiercest the temperatures can top the high 30s and even venture into the low 40s. A nice place to cool off is La Fuenta Mora (The Moorish Fountain) at the foot of the village. It has been a source of water since the Roman times and people still wash their clothes here. The natural spring water is drinkable and many people fill up empty containers, a practise which has been going on for centuries. 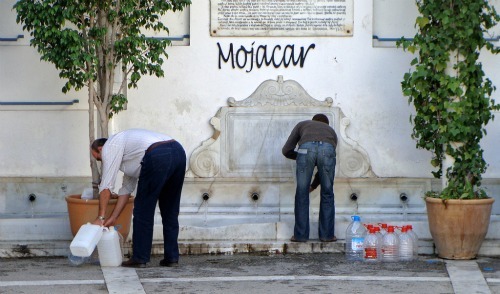 If you have a reasonable understanding of the Spanish language you’ll be able to read about the history of Mojacar as it is written on the fountain’s walls. 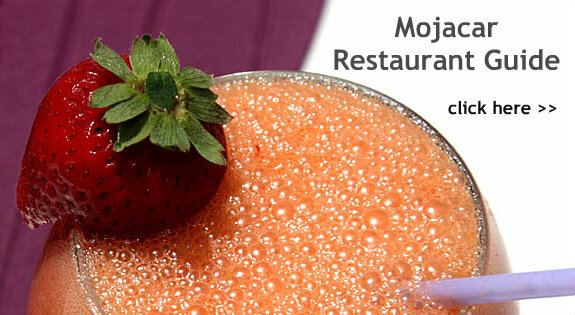 Dining out in Mojacar is a particularly memorable experience. The cool night air is fragranced by the sweet smells of herbs and spices coming from the many restaurants and bars and candlelit terraces give off a warm reddish glow to match the colour of the setting sun. Once the sun has dropped behind the mountains you’ll see twinkles of light from the nearby mountain villages of Bedar and Lubrin. During your visit to the old village you will come across a lucky charm symbol painted on many homes and businesses. This is the Indalo Man , an icon of the province of Almeria and it depicts a man holding a magic arc that protects against storms and evil. It is said to be 4,500 years old and is associated with Neolithic paintings found in the caves of Velez Blanco. One of this quaint Andalusian village’s claims to fame is that it is believed to have been the birthplace of Walt Disney. According to local lore he was the illegitimate son of a washerwoman who fled to America where he gave him up for adoption to Flora and Elias Disney in Chicago. This version of his birth is hotly disputed, but that hasn’t stopped the local council from suggesting plans to rename the main square and various streets after the world famous animator. History is very important to Mojacar and for three days every June there is the spectacular Moors and Christians fiesta that commemorates the expulsion of the Moors from the region. Bands of marching and marauding men, women and children decked out in elaborate costumes and brandishing sabres and muskets engage in pyrotechnic battles that fill the air with loud gunfire and smoke. 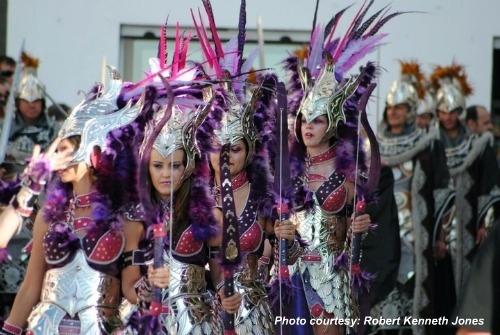 The entire village bursts into life with colourful parades, clattering swords, belly dancers and hundreds of people partying under banners, symbols and coats of arms. Everybody is welcome to join in the fun. The torchlight procession on the first evening leads straight up the main road to the village, and is a very steep climb. Many adult participants typically prepare for the arduous ascent by drinking, smoking and eating. And how they make it to the top whilst playing their brass instruments is a Herculean feat the amazes the crowds of visitors. The party goes on until the sun comes up and then it continues with more parades and jousting competitions, some of which are held at Mojacar Playa, the uncrowded beach resort situated below the ancient village. The seafront extends some 17km, of which about 8km have been developed. The brilliant blue water is warm for most of the year and several beaches consistently earn European Blue Flag awards for their cleanliness. Although the area is a tourist hotspot its development has avoided the pitfalls of other Spanish tourist meccas that collectively hit the overload switch on concrete mixers in the 1970s. Most of the buildings are refreshingly low-rise, with some reflecting the region’s Moorish past. For sports enthusiasts there are plenty of exhilarating activities to stretch sinews and muscles including jet-skiing, windsurfing, horse riding, sailing and canoeing. Or how about taking a closer look at the local marine life with a scuba diving excursion? There are schools that cater for all abilities, even absolute beginners. Mojacar is also a popular destination for golfers who head for the Marina course with its beautifully manicured greens and sea views. The seafront is flanked by many fine bars, cafes and restaurants including some of the hippest hangouts in the area. Maui Beach is a bar that rarely sleeps and caters to teens and the twenty-something crowd. During the day it serves juices, soft drinks, cocktails and an array of paellas and bar snacks, but once the sun goes down it turns into a decadent oasis, and rivals the Mandela club a few doors up for the playa’s party central crown. 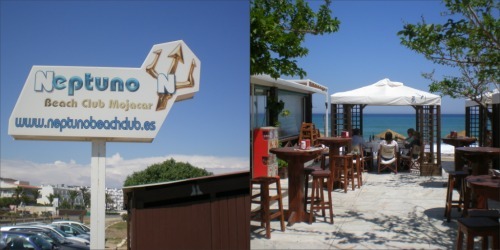 For those who prefer a slower pace there are fabulous restaurants with glorious ocean views such as Neptuno Beach Club, L’Incanto, Fantasia and Tito’s which is the oldest chiringuito in the area. After your meal take a stroll along the palm tree lined promenade and enjoy its peace and tranquility. Popular, but unspoilt, Mojacar is a traditional Spanish village and resort that has achieved a good balance between heritage, tradition and the needs of today’s tourists.